In many shopping streets and centers, slipperiness is treated with ordinary road salts, only because people lack awareness of better alternative solutions. Just imagine, your beautiful shop in the middle of all the beautiful shops of your fellow shop owners, with expensive and nice carpets or wooden floors…… Then on a winter day, snow and/or ice and ordinary road salt being used to treat the slipperiness……. Snow and the very corrosive road salt will get mixed and via the shoes of your customers, this corrosive mix of salt and water ends up on your expensive and nice carpet or wooden floor, resulting in white corroded stains that can never be removed! 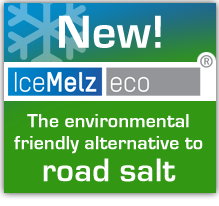 That’s why: use IceMelz eco during the winter months to protect your customers and your shop!